Viola Davis revealed all at the 2017 SAG Awards. 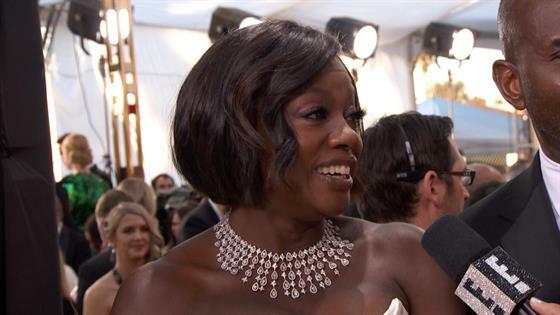 Davis, who is nominated for her work in Fences, didn't hold anything back when she and her husband Julius Tennon stopped to talk to E! News' Giuliana Rancic, from Jacuzzi parties with Octavia Spencer to her secret to surviving the red carpet. "So far it's tame, my feet are OK," she said about her red carpet experience. "I sprayed a little thing on my toe to numb my pain. I got it online." It's called Still Standing, she said, and "that's why I'm still standing." Davis opened her purse and showed off her other award show secrets: her slippers. "If I had some prosecco in there it'd be perfect," she said. Davis has made it no secret that she's a fan of prosecco and hitting the hot tub after a long day and she said her The Help costar and friend Spencer called her up to get in on that action. "She called us at the last minute and was like ‘Girl, I need to get into the hot tub.' We said, ‘Yeah sure, come on over!'" Davis is nominated for her work in Fences, she also received an Oscar nomination, her third time up for an Academy Awards. She said Fences has hit because it's relatable. "I just feel like Fences is a story of my people, of my father, of my mother. And they were not people who invented anything. They are not people who will be in any history books, they were average everyday people who are just living their lives," she said. "I always say as an artist if you're breathing, your story deserves to be told. That's what August Wilson did…It's so universal. That's what I love about it." Davis is known for her award show speeches, but there's nothing planned for tonight. "I showed you my purse," she said. "I've got still standing…I've got nothing. I'm not saving the world tonight. I'm drinking." For complete SAG Awards coverage, watch E! News Monday, Jan. 30, at 7 p.m. and 11 p.m. And don't miss the Fashion Police 2017 SAG Awards special Monday, Jan. 30 at 8 p.m., only on E!